easily to enjoy wonderful indoor movie night and backyard movie night with kids or friends. Suitable for most LED, LCD or DLP mini projectors on the market. you can enjoy optimal image and color reproduction with this movie screen. 【Portable Video Projector Screen】: this foldable projector screen is convenient for storage and carrying. You can fold the screen in small size and put it in your backpack or suitcase, or just take it in hand. And the light projector screen only weight 2LB. Easy to carry anywhere you like ! 【Multifunctional HD Projection Screen】: it is perfect for home theater and home cinema to enjoy indoor movie night and backyard movie night; ideal for gaming projector screen; and you can set it up as overhead ceiling projection screen. Moreover, it's also ideal choice for public presentation. 【Easy to Set Up】: this 100 inch Projection Screen has 12 grommets holes for mounting it or hanging it. It's flexible and easy to mount to the wall. You can set it up on wall with nails, hooks,ropes and double-sided tape or you can also tie it to the pvc frame. Easy to set up a home cinema to enjoy indoor outdoor movies. 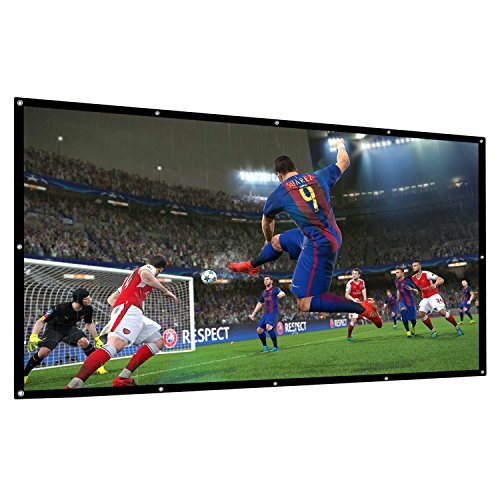 【With Black Backing Prevent Llight Penetration】: with the black backing, this HD projector screen is twice as thick as others, effectively prevent light penetration for clearer picture. 【Best Viewing Experience】: diagonal 100 inches 16:9 screen format, offer 87" x 50" viewing area and offer high color reproduction. Made of anti-crease material. If there is any wrinkles caused by transportation, please hang the screen for a few days. If you have any questions about this product by AbdTech, contact us by completing and submitting the form below. If you are looking for a specif part number, please include it with your message.